Throughout the chapter Hallsmith reiterates the importance of widespread involvement of the community in the process of the creation of a community vision. Her approach is both highly democratic and compassionate, referring to “caring for others” and “empathetic, reflective listening” as important elements in reaching this goal. Hallsmith points out many of the problems with her own suggestions with examples such as “It fails because the steering committee doesn’t really get it…” referring to the difficulties of a group carrying out a single vision. Hallsmith concludes by giving examples of real community vision statements of several U.S. cities. As I read Hallsmith’s ideas I can’t help but feel skeptical. The skepticism however is not because I believe people are greedy or evil or self-serving or even couldn’t be shown a greater way of doing things. The skepticism comes from the fact that what Hallsmith ultimately fails to provide a roadmap from where we are now to where she proposes we go. Hallsmith writes that “real change requires a change in behavior.” I think few will disagree with this, but how does behavior change. Does it change by being told to change or is it by seeing the advantage of change? Hallsmith outlines no means for recognizing what she sees as human needs as the basis for a community vision. She fails to include the need of leadership on the execution of a vision and how very often leadership, compromise and community involvement result in struggle. If I am to be skeptical of Hallsmith and her ideas I must also be skeptical of others who dream of a better way of doing things, but fall short in providing directions on how to get there. It’s certainly easy to say that things won’t work because they haven’t. Certainly, the reader’s reaction to this chapter will be based on their expectations. Where I was looking less for a confirmation of where we wanted to go and more for constructive thoughts on how we want to get there, I was slightly disappointed. Still, I can’t help but hold admiration for the author in hope to create a better way of doing things. Afterall, no one criticizes John Lennon for Imagine, perhaps Hallsmith is simply a dreamer. She’s not the only one. In this chapter Hallsmith identifies the process by which a community can gain an understanding of its inner workings to develop a more sustainable way to meet its needs, as well as ways to create a comprehensive plan that addresses the needs of the present generation and protects resources for future generations. Hallsmith provides several examples of communities that have created comprehensive plans and tastes of the results from their plans. The one question that lurked in the back of my mind as I read this chapter was, “Is it really possible?” This is a question for which I have no answer, but one I hope will become more apparent in the decades to come. Hallsmith’s lofty goal of creating community plans that require pooling resources and working together for the greater good does not address the basic and insidious value of selfishness that exists throughout humanity. While she does note the presence of “profit-at-all-costs, consumption-driven ideals” in Western society, she does not address the more basic need and desire that drives such a lifestyle (94). As noted in The Selfish Gene by Richard Dawkins, biology may create the basis for putting the needs of oneself, and one’s genetic relatives above others. Breaking down the evolutionarily created boundaries to cooperation among large groups – when there is no immediate danger – has been an ongoing struggle of human culture, and one for which I am skeptical. At the opening of the chapter, Hallsmith states the need for a community’s vision to “reflect principles that will insure the continued health and vitality of the plant to support the goal of sustainable cities.” The author discusses the Earth Charter and the Melbourne Principles in this chapter, and relates them to the social system, the world of power, the economic world, and the physical environment. Hallsmith defines the Earth Charter as a sort of Bill of Rights that includes the rights of nature; a vision for the planet; an international treaty, written by the people. She calls it “a vision for ways in which all our needs can be met,” tying the patterns and needs of natural systems into the patterns and needs of the community throughout her discussion. However, I wish there had been more of a discussion of how we can practically apply some of these principles in the fields of design and planning - perhaps this is addressed in yet another chapter. Throughout her discussion, Hallsmith stresses respect and care for the community of life-in all its forms, as outlined in the Charter, as a critical part of working toward sustainable, democratic communities. She reminds the reader that relationships are interdependent, as are systems, including ecological systems, and stresses the value of all parts of the system, regardless of their intrinsic value to human beings, because they are integral to the functioning of the system. She also states that families need to be strengthened, as “so many government policies today erode the family.” I’m not sure that I can agree with her on this point, as it seems unsupported by examples; she goes on to mention work vs. school schedules, welfare, and social security. She also discusses health care, sustainable education, lifelong learning, and the use of media to increase social development and raise awareness of ecological and social challenges. When discussing the political system, Hallsmith points to power, justice, equitable access, and conflict resolution. She cites fundamental freedoms as providing the opportunity to realize one’s potential, but reminds us that freedom of action comes with responsibility to care for the environment and hold actors responsible. The author calls for the elimination of discrimination – political, social, and economic equity, and universal access – not only physical, but access to information on environmental matters. She also suggests demilitarization to a level of defense, and putting those funds toward peace and ecology, supporting environmental protection.. In her vision for the economy, the author suggests the eradication of poverty, equitable distribution of wealth among nations, increased resources, and social and economic justice. Eventually, Hallsmith addressed the physical environment, which I felt had been essentially bypassed, aside from her use of terms like “sustainability” and “environmental protection.” She calls for the support and rehabilitation of natural systems, for the protection of biodiversity, for environmental conservation. She urges a cautionary approach, particularly when information is limited or predicted results are unclear or uncertain, in order to prevent harm. Hallsmith also suggests imposing a “burden of proof” upon those who claim their actions will cause no harm, and holding them liable for the consequences. The author briefly addresses housing, energy, and transportation, then promotes the use of environmentally sound technologies for the production of local goods and services, suggesting the internalization of the cost (environmental and social) or goods in their pricing. She also includes water, communication (between cultures and worldwide), and waste processing as things that are also imperative to the creation of a responsible, democratic, and just society. Hallsmith brings in the Melbourne Principles for Sustainable Cities as a way of interpreting the Earth Charter. These essentially bring in the main points from the charter, and also encourage the minimization of a community’s ecological footprint, empowerment of people, cooperative networks, using ecosystems as a model for healthy and sustainable cities, and good governance. At the beginning of Chapter 10 (Initiating Action) Hallsmith asks an important question: “How do we initiate action so that our vision can become a reality?” She answers this question by explaining that we must first identify what we want to change and then note all of the links that our challenge shares with the environment around it. At the most basic level, Hallsmith asserts that we can initiate change as long as we understand the many links that join together the actors involved, the resources that are available, the constraints that we face, the values and mindsets that guide the population, and the innovative opportunities that exist. After considering all of these connections, we can form a plan. 1) Develop a plan that allows for and encourages feedback from the community. As a class, I think we have already set a standard of open communication that allows for feedback. In our project groups we must do the same by listening carefully to feedback from the community and then by processing this feedback appropriately—whether we disregard it, modify it, or incorporate it fully into the plan. We must foster an environment where it is okay to make mistakes and where people feel respected and valued. 2) Think in terms of processes. I usually regard economic costs as the most important factor in my decision making process. Yet Hallsmith encourages us to recognize that all aspects of life are connected and that we cannot rightfully separate one category (say economics) from another (say the environment). In my group, I need to consciously make an effort to place the same value on natural and social processes as I do on economic processes. I must force myself to recognize the relationship between each of these areas. We wonder why sustainability does not gain the respect and attention of popular culture, but the answer is simple; sustainability requires people to adopt a new paradigm—one that might challenge everything they believe in. We are not only asking people to change their habits, but we are selling them a belief system. On another note, Hallsmith argues that all members of society should engage in dialogue and in the planning process in order for us to reach the best and most sustainable solutions. This dialogue, however, does not happen easily. Not only do people hold fundamentally different beliefs from one another, but they usually make decisions based on their own personal interests. Perhaps our job, then, is to bridge the gap between these conflicting interest groups and find common ground where everyone can agree. Read the instructions, download the forms, get photos, etc in advance of Thurs!! Remember, you are responsible for taking initiative-take the ball and run with it! During class on Tuesday I was thinking about how to gauge if any sustainable practices actually work. It sounds like an easy question, but how do you really know if you and your community were successful in attempting to create a sustainable community? I sought answers in chapter 11 only to discover that gauging success is incredibly difficult. Hallsmith begins the chapter explaining that humans are great at problem solving through specially designed programs. She then says the pitfall of this is that people tend to end up caring more about if the program goes as according to plan than if the program actually achieves its purpose. The sight of the big picture is often lost. This is one of three problems that Hallsmith acknowledges in evaluating success. She describes it as the lack of a holistic approach. In an example, Hallsmith discusses this problem as a “vicious cycle” of “grow grow grow”. It is very difficult to know when to step back and analyze the progress based on the original objective. Another difficulty in gauging success is the tendency to judge the progress of a program based on activities rather than results. Most sustainable programs do not have the resources to get the information that will tell them the impact they had on their surrounding environment. Hallsmith calls this “the activity trap” when progress is gauged based on secondary measures such as amount of people trained in sustainable living or the number of energy efficient materials that were installed in the lifetime of the program. Although this may be a decent subjective indicator of the success of a program, there is no guarantee that these activities actually had any affect on the planet’s natural systems. In an account about a California based group called Common Ground the success was measured based on the semi-celebrities that attended an event… no way to gauge actual environmental impact. One of the most risky aspects of beginning a sustainability program is the repercussions it may have on externalities. Some programs may be deemed successful as they had “solved” the problem at hand, but in the process of solving this problem new ones were created. Can an instance such as this really be considered a “success”? This is why “indicators” are the best gauge as to the success of a program. These indicators are based on natural phenomena; for example, how an ecosystem is doing based on the number of salmon swimming upstream. In a concluding statement, Hallsmith writes that “Ultimately, the success of efforts to improve sustainability in communities will be evaluated based on whether or not all the human needs are satisfied…” In other words, it is virtually impossible to claim a sustainability program is entirely successful. Chapter Summary: In Chapter 1 of The Key to Sustainable Cities, Gwendolyn Hallsmith argues that all government is local. Individual people at the local, grassroots level initiate the political and social changes that occur in national government. Thus, the larger government institutions are simply byproducts of the efforts made by involved and engaged citizens. These individual community members act out of a necessity to fulfill their basic human needs. When the local systems, fail to meet their needs they in turn seek to change the system. As a result, their needs have become the impetus for the creation of more complex and, in most cases, less sustainable systems. In this chapter, Hallsmith introduces and describes the difference between sustainable local systems and unsustainable local systems by contrasting two cities: Randolph, Vermont and Naryn, Kyrgyzstan. In her contrast, Hallsmith explains that Randolph, the sustainable city, has a bustling city center, developed western cultural identity, growing economy, local citizen participation, and a democratic political system. As a result, this local urban system is effectively meeting the needs of its citizens. On the other hand, Naryn, which lacks all of the above stated characteristics of a sustainable system, is not meeting the needs of its citizens. New Learning: In this chapter, Hallsmith gives readers a very vague idea of what a sustainable city looks like. In her vision, which Randolph seems to exemplify, citizens’ active, informed and engaged participation in local government is essential to creating sustainable cities. This link between citizen participation and sustainable cities is quite interesting considering that at the beginning of the chapter she suggests that it is citizens’ actions in response to their growing needs that propels the development of these unsustainable systems. Nevertheless, it seems that she also suggests that cities like Randolph are using citizen participation as a strategy for establishing sustainable systems. Unlike the citizens of Naryn, the citizens of Randolph had a voice in local government that was not only listened to, but also taken very seriously. Hallsmith’s ideas about citizen participation are extremely relevant and can be incorporated into our work as students and professionals. Quite remarkably, Hallsmith brings light to the circular nature of society, communities, and systems. It is individual need that sparks development of more complex and often unsustainable systems. Once these more complex systems begin to negatively affect individuals, they will again act out of necessity; the need to create more sustainable systems. By giving citizens the space to act out their natural roles in these systems governments can do their part in working toward sustainability. - Change is not static, it is an ongoing metamorphoses. - In order for change to be effective those effected by the change must be involved in developing it. - There are different players in change: Innovators, change agents/ opinion leaders, trendsetters, conservatives/mainstreamers, reactionaries, and curmudgeons. Each plays a different role in the change process, whether it be by enabling or inhibiting it. - Conflict is an inevitable part of the process to create change, a facilitator needs to anticipate this instead of fear and deny conflict. The idea that was most important to me during this chapter was the idea of involving community members in the process of change. This fits in to the question of how do we get people to grasp an idea or complete change in thinking. Hallsmith settles this problem by explaining that change is gradual. Ideally one should not have to get people to except an idea but come up with it themselves. In this way people will no longer see it as an outsider coming in to create change but as actions coming from within the community. This can be done through a group process, although this can decrease our ultimate vision more will be accomplished. Despite Hallsmith’s urges to include the community some of her methods seem to include the community members in a false manner. She describes reactionaries and curmudgeons as those against change, portraying them in a negative light. Viewing them as such would seem to lead to more conflict as these members of the community will feel they are not listened to. Additionally Hallsmith portrays conflict as a completely negative experience, ignoring the fact that often creativity and understanding can come out of the “storming” phase. In Chapter 5: Celebrating Assets and Creating a Vision, Hallsmith outlines the initial steps in the process of creating sustainable systems in a community. The three main strategies she suggests are (1) community participatory planning, (2) taking a community asset inventory, and (3) determining a shared vision. A community participatory approach often involves including stakeholder groups in planning meetings. The idea is that people are more likely to embrace change when they take place in choosing the changes that need to happen. The community asset inventory approach is expressed as an alternative to a problem-centered approach. Hallsmith encourages an identification and celebration of the best experiences that already exist. She recommends mapping the assets in reference to the corresponding needs that are being met. A mapping should then reveal the areas that need improvement and gaps that exist. Creating a shared vision is the final step in this preliminary planning process. Collective goals are expressed and combined to create a consensus on where the community wants to go. Hallsmith mentions The Earth Charter – a Vision statement for the world. Over the summer I worked on a project proposal to create an inventory of obesity prevention programs across the nation. This was an asset-based approach; to see what services were provided by each program and examine what impact the programs could have if they formed partnerships in their communities. Hallsmith talks about mapping the system of assets to provide a visual representation of what needs aren’t being met adequately or at all. This sounds like it could be very effective, but I have a hard time picturing what it would look like, especially with more than one factor (i.e. ; water AND transportation on the same map?) An illustration would have been extremely helpful here. Hallsmith recommends that each part of the community be represented. She asks “Why do citizens get involved with local decision making? Why do they not?” but she doesn’t really answer this – There is an underlying assumption that there will be volunteers from each part of the community to participate in the planning process. The people who are less inclined to participate may be hesitant based on something related to a lacking asset – and so are ironically the very people who should be there – and the question should be “is it possible to involve the quieter, less assertive voices of the community?”. Hi everyone! I just recently joined the class, so here is my first assignment. (a) It seems that Hallsmith has the concept of community as one overlying theme which is comprised of social, economic and political factors. Each plays a role as a key concept in the reading. These factors interact in a web-like fashion all affecting one another in a particular hierarchy: the social goals drive economic goals which in turn drive political goals. The sustainable community is discussed in terms of how each facet of communal living is connected with each other in convoluted ways. It is the relationships between these concepts that drive the possibility of sustainable living. In certain ways, the very definition of a community makes one sustainable. Communities are systems or organizations that are built in order to nurture success and positive growth. Examples Hallsmith gives of community social needs include “peace, health care, lifelong learning, meaningful relationships, a sense of belonging, self-expression, self-esteem, beauty and spiritual life”. To achieve many of these goals there requires an economic need – money. Hallsmith says economic security can be achieved when people pursue their “creativity and natural productivity” which can be sustained by the natural world. It is the political responsibility to foster this sustainable atmosphere. Together these all make up the community. (b) This reading was very relevant to our course in an interesting way. Our course is essentially the political aspect of a community that was such a key concept to Hallsmith. The political part was what essentially helps drive the community. The class was built to embrace the social needs of the students by encouraging self-expression and meaningful relationships. “Economic security” is achievable as we have the ability to be creative and naturally productive in class and the class itself is the organizational factor that helps to solidify the community. Our course is essentially defined by the key concepts of Hallsmark’s writing. Typically, I personally do not think of communities in such a logical perspective. The depiction of the sustainable community in this step by step, logical way allows me to think more strategically of the community of which I am a part. Each of us contribute to our communities in one way or another and this scientific approach to dissecting it helps me to begin seeing my own role. (c) What I would really like to know is where the environmental aspect fits into the big picture from my perspective. What is the environment? Is it a social, economic or political factor? I think that it may deserve to be a subsection of the community as a whole, not a subsection of its individual parts. I understood what was mentioned regarding the environment, but I felt that it did not fit in properly. As a critique, I found the reading to be repetitive. I think the concepts were explained fairly well in general, but the reading seemed rather unorganized as it jumped from one key concept to the other only later to refer back to the first one. The charts were not of great help to me and if Hallsmark was a little more succinct there would have been no great need for them. After Tuesday’s discussion, the biggest questions in my mind were: how do community leaders get citizens involved in sustainable development? What are some basic strategies that community leaders can use to facilitate change? I chose to read Chapter 5 “Celebrating Assets and Creating a Vision,” (p 86-98) because I felt this chapter reveals a couple of basic approaches toward creating a sustainable community. .• After the surveys are compiled, it is important to make an assessment of how all the assets are meeting the community needs. An inventory should be conducted to note how sustainable or unsustainable the current practices are. This community “sustainable health report” will give the community a whole view of where the community needs to fill in the gaps to become more sustainable and is the basis for a comprehensive plan. • Finally the community should adopt a community vision based on the surveys and sustainable practices assessment. The community vision should entail all the goals for the city including social, economic, sustainable, ect. The vision should articulate how the community would like to be in the future. The vision should be relatable to all the citizens and invoke excitement and passion. Hallsmith states that these steps aren’t easy and most attempts will fail. However, this chapter provides basic action steps for a community to start the progression towards a sustainable community. Absolutely there will be citizens that are unable or unwilling to be a part of a sustainable movement. However, Hallsmith’s tries to provide steps to apply to begin to gain support. There are many points raised in the chapter that describe a variety of problems and solutions that different types of communities and different aspects of a single community face often. When Jay Forrester began his study of social systems in 1956 out of MIT, he broke ground on a frontier that has blown up into such a complex methodology that is used to create situation analysis for present day problems that communities face. One of his most imperative points that he brings to light in this chapter was the fact that in a system, the connections and relationships are more important that the elements themselves. I partially agree with this statement, but feel that the elements are the foreground and basis of these systems. So while the connections are important, without and elements or particular kinds of elements the system can easily be flawed. A system needs the right elements to be successful; it cannot just rely on the various loops that interconnect. Hallsmith goes into detail and explains a numerous amount of feedback loops and how each one differs from another. One basic example, how a positive feedback loop would for instance make two dominoes fall the same way and a negative feedback loop be compared to a see-saw where when one side goes up the other goes down. To take feedback loops to the next dynamic level, system archetypes include different types of feedback loops working simultaneously. Hallsmith gives the example of traffic congestion in this chapter (figure 4.13), which exemplifies a positive feedback loop, a negative feedback loop and delay. While these scenarios are more or less hypothetical, they are based on social science and human trends. As the single problem of road congestion arises, there are many elements involved that seem to be logically deduced, but in the end, more congestion is produced and the problem has not been solved. These systems definitely have a lot of feasibility and can anticipate an outcome before money has been spent, roads built, time wasted and resources used up. I feel that while these systems do that, and do that well. It is our job or someone’s responsibility to than go from there and come up with a system or a solution so that these problems are no longer feedback loops but linear and corrective. We need to learn how to manage congestion in a way to not create more on a larger scale. Hallsmith does a great job of pointing out the how’s and why’s things are the way they are, but lacks in presenting reasonable solutions. Hallsmith believes that to create a community vision you must first start with an empty agenda, and open mind. The most desirable next step would be to educate the community on systems thinking. Since this is not usually very doable the next best thing is to figure out what assets already exist in the community and recognize them. Assets are determined by HOW they help fulfill community needs. The next step is to determine how all the needs of the community (which are social (well-being), governance (empowerment), economic, as well as infrastructure and the environment (material)) are met, not just celebrating those that are most effective. During this period criticism and negativity must be addressed to further the pursuit of trust building. Diversity of people and their opinions is also highly recommended. Next, the sustainability of the community system must be evaluated through either assessing the capacity available within the needs satisfaction system, or by ranking assets by the level of impact they have. By making this picture clear (through a diagram or some other sort of visual) you will finally be able to identify the places where needs are not being adequately met, if at all. Now comes the hard part, trying to get a community to articulate a shared vision (direction and goal). This vision must in addition be simple and most importantly change the BEHAVIOR of the way the community (individuals) think and act. An interesting example presented was that of Burlington, Virginia where a survey of three questions were sent out (What do you value about Burlington? What do you want to stay the same for your grandchildren? / What do you think needs to change? / What ideas do you have for improving things in Burlington? ), ideas compiled, and then a simple vision for the city written (addressing the economy, neighborhoods, governance, youth and life skills, and the environment). I think that this is a very clear procedure. I almost wonder why it hasn't been done more often. Of course it seems almost too simple, but Hallsmith does discuss a couple of difficulties that may be encountered. This seems like a plan that would always have to be modified to fit each city with their own problems and solutions. It probably is being done...maybe not with great success most of the time, or unnotable success. This applies to what we've read before about systems. It applies most to why we need to think ‘systems’, in order to see the greater problem, and then prioritize what is most grave. The only thing is, what is the point of determining systematically what is wrong/missing by way of community needs, if in the end we will let the community individuals (who may not know all the facts...most likely don't) make the decisions? The 7th chapter in the key to sustainable cities book, “Challenge of Change”, offered some insight into these questions. First, the nature of change and how humans generally react to change was addressed. People generally do not like change, especially when they feel that the changes are brought onto them, that they have no control. Several types of change were discussed. Cyclical change describes small changes that occur so a period of time only to return to the original state—putting storm windows in during the winter is an example of this type of change. Incremental change describes a process in which small changes occur over time and generally go uncontested and unnoticed. The type of change needed for people to move toward creating sustainable cities is structural change. This type of change is radical. Now that the foundation is set and a goal has been established, it is time to find the means to do it. Servant leadership is described as the type of leader who seeks to serve others first, before establishing any power/leadership role. Leading in the opposite direction is generally done by egotists, acting out of fear and a lack of trust. That kind of leader is not what is needed for effective structural change. Servant leadership is all good, but we need more than one person to start this revolution. The innovator is the person who comes up with an alternative way to do something, this individual is the starting point for change. Next are the opinion leaders/change agents who convince others that the innovation will be successful and will help consumers. Trendsetters are next in the process, fearlessly investing in the new innovation. Conservatives/mainstreamers are the people generally resistant to change, however, the extended time they take to accept the innovation provides stability to the system. Iconolasts are the social critics who challenge old ideas but do not come up with new ideas. These types can be very helpful to what is now becoming the innovative movement. Reactionaries and curmudgeons are the people who generally resist any change at all, however there is a slight difference between the two. Reactionaries protest any change to the status quo, whereas curmudgeons challenge everything. Spiritual leaders are the people who inspire the masses to think and believe in the new concept on a higher level. Examples of these types include: Martin Luther King, Ghandi, and the like. Moving to more practical application of this knowledge, the author outlines 9 guidelines for conducting successful and insightful group processes. 1. Speaking, 2. listening, 3. Using time, 4. open to outcome, 5. focus on system as the problem, not the people, 6. Keep arguments, 7. be present-oriented, 8. avoid hypothetical situations, 9. always do your best. These seem to follow closely with participatory practices and I will discuss them more when I connect them to my experiences. Community patterns of group behavior are next laid out in a helpful manner: forming, storming, norming and performing. These words represent the stages of group behavior that service leaders looking to create structural changes should identify. Also, someone in this position must identify elements of a system likely to resist change and provide openings to external influences that might facilitate change. The chapter is ended with examples of stakeholder participation on a governmental level. Proxies are defined as people who are chosen to represent particular interests on a board that helps government make decisions. Also, direct democracy through Town Meetings is also defined and discussed. B) So, how does all of this connect to our discussion? I’d say that our discussion on Tuesday hovered around the issue of how structural change should occur in order to be successful, and this chapter provides a general description of practices that will lead to success. Generally, it seems like the advice is to be open to new ideas and to extend leadership opportunities to stakeholders so they take ownership of the process. In what part of the process of group behavior are we in now? It feels as though we have come upon the “forming” stage and are beginning “storming” and “Norming.” I would say that we will fluctuate back and forth between these stages as class progresses and the goals become more clear. C) It is hard to make a critique of the this chapter because I am familiar with the practices and principles which the author proposes. If I had never heard of participatory planning practices I would be learning the principles through this reading without really having a name for it. It seems clear to me that approaching structural change with an open and inclusive attitude is the best practice. Though the author does credit others for their work in this field, reading this chapter should not serve as a general introduction to participatory planning practices. I decided to read the chapter called "Success" in Hallsmith's Key to Sustainable Cities because of the discussion in class on Tuesday. It seemed important for the group to understand what exactly Hallsmith means by terms like, "whole human life," "basic needs," and even sustainability itself. What, for her, is a successful sustainable community? Is such a thing possible? Unfortunately, I was not able to discover her exact definition (not a surprise). It was more the case that by not telling us what she thinks, she was hoping for us to examine what we think is successful. Most usefully, she cautioned that rather than following procedural guidelines to the tee, one should carefully delineate the goals or aims of a certain project before beginning. This way, it will be more clear at the end whether the project was a success or not. Instead of spending time fulfilling the requirements of the funders, one should spend time evaluating whether the initial (ideals?) goals are being met. This is almost common sense, it seems. So I wonder a couple of things. The system that is in place currently, where a foundation or organization calls for grant proposals include certain requirements for an appropriate project, is the way things are right now. How can we change that? Can we? (Who is we?) Also, I begin to wonder how it came to be this way. I ask this in a larger context as well. It seems to me we cannot fix something we don't understand. So how has society come to be the way it is? In the end, she writes that, "Ultimately the success of efforts to improve the sustainability in communities will be evaluated based on whether or not all the human needs are being satisfied in the community." (P215) Still, one might wonder what are needs and who can/should define them. Is it like Thoreau said, and all a person needs is food and shelter? Or are needs defined by the television? Or as we are wont to do in the United States, entirely on an individual basis? I found this chapter particularly relevant after Tuesday's discussion. Let me begin by quoting Hallsmith's final sentence: "whole systems change comes about through co-creating a shared vision, generating a contancy of purpose, and germinating new emergent possibilities." After identifying the dynamic systems relationships and how these systems work in order to implement a new vision it is important to review different transformation strategies to determine how to successfully implement the vision. Hallsmith begins by recognizing that due to a city's complexity, metamorphasis is a better term to speak about the changes that occur when implementing a vision. Hallsmith writes of the success of servant leadership, essentially the concept that strong leaders have been servants first, additionally, that this is a leadership of service, not ego. When I was given a promotion at the small, four-person, non-profit I worked at before coming to Cornell, I felt my abilities as a leader were enhanced by the fact that I had worked for a year "in their shoes." I could use my own experience as a "servant" to be a better leader. Another principle identified by Hallsmith is innovation diffusion, a concept developed by Everett Rogers. Innovation diffusion looks at ways in which people respond to a proposed change and attempts to identify personal response patterns that can be applied more generally to the population. I felt that this principle was most applicable as both a way of anticipating how people will behave, but also as a strategy that can be used to implement change or metamorphasis. The main players in this strategy are the Innovator, Opinion Leaders or Change Agents, Trendsetters, and Conservatives or Mainstreamers. Innovators are individuals who may come up with a change but are too isolated to implement or communicate it. Change Agents have the social skills and connections to communicate the innovation to others. Trendsetters are the people that are the first to embrace the innovation. The Mainstreamers are the group who are resistant to the innovation. They need to see clear demonstration of the benefits before they embrace the innovation. An example of this would be an Innovator who sees that recycling can reduce the amount of waste they output. A Change Agent sees the social and economic benefit of recycling and uses their influence to implement a recycling program, possibly through their influence in city government in this case. Trendsetters are the first people to fully use the program, and give it enough popularity to continue. Mainstreamers may be resistant to recycling, feeling like it is too much effort but hopefully would see the results, or the economic benefit of the recycling program, such as the one in Ithaca where recycling saves on the cost of trash tags. The other players in innovation diffusion are Iconoclasts, Reactionaries, and Curmudgeons. These outsiders are more difficult to engage and their identification in innovation diffusion demonstrates Hallsmith's other most relevant point to our recent discussion: one person really can't change anyone else and that innovations are more successful when "the people on whom the change is imposed agree to it." Hallsmith outlines several other strategies for participatory processes which engage all the affected parties. These strategies include tips on successful meetings, retreats, and conflict resolution. The greater inclusivity of the process, the greater potential for success. I chose to read Hallsmith’s chapter on Leverage Points (pp. 169-185). I wanted to learn more about some of the strategies to effect change, since overcoming inertia and engaging nonparticipants seemed to be threads running through Tuesday’s class discussion. Leverage points, as defined by Hallsmith, are institutions or actions that can help to spur or solidify a community’s commitment to change. To that, I would add that people can sometimes be leverage points: witness Bogota’s mayor, Nelson Mandela, MLK Jr., etc. Although their strategies and actions certainly made use of leverage points, I would argue that the people themselves became emblematic of the possibilities for reform. Building community spirit around a natural resource (i.e., a watershed or river) by initiating a festival or outdoor classroom that will raise community involvement and awareness around the issue. As any student of business knows, there is such a thing as negative leverage. Hallsmith stresses that finding leverage points may be relatively intuitive, especially for those who are intimately familiar with the system(s) they are trying to change. However, she cautions that precisely because these points often represent the confluence of many groups or perspectives, and because the issues tend the be somewhat sensitive, applying pressure to the points to effect change should be done intelligently and sensitively. I would agree with this assessment; it’s clear that issues such as land development, school budgets, and other community matters can just as easily (and probably more often than not) divide as they can unite. But, because they tend to be subjects that elicit strong feelings among stakeholders, a positive outcome can have truly transcendent results. One key concept Hallsmith presents is the belief that people need other people in the form of a society or community, and that in order to meet individual physical and material needs the community's needs must be met. These needs being physical well-being, economic security, governance, and social well-being. All of which must be met also to achieve "whole human lives". This leaves the question of who is to determine what is to be considered a "whole" life. Some individuals would be happy to rid themselves of the ties that seemingly bind us to society. This brings me to question whether, just because the world we live in now ties us together, this is the best way to live. Dependent. Another interesting point Hallsmith discusses are her 5 key variables for sustainable economic development. 1. trust, cooperation, and leadership in a community leading to collective action towards improved local economy. 2. equitable distribution of economic resources. 3. new products and services created or have value added to them within the community. 4. income in a community spent and invested locally. 5. way in which products and services are manufactured, cultivated, or created has to be sustainable and environmentally sound due to carrying capacity. I question the attainability of some of these pursuits. In particular the 'goodness' of people to be equitable in this country. I feel people think they work for and earn their luxuries, and the fact that some people are born disadvantaged does not mean they should be given a level playing field. Throughout Hallsmith points out that power should be spread amongst individuals in the community, in this way avoiding the vicious governance cycle of overworked decision-makers making bad choices. She proposed instead that the community form committees to make some of these decisions. I agree that this may lead to better decisions, I do wonder whether this can be done in an efficient matter. The most imporant concept Hallsmith reiterates is "the whole is greater than the sum of it's parts." She shows this through the various systems of feedback loops. This point also emphasizes the need not only to see problems and find solutions, but analyze and make links between problems in order to realize and solve the true problem. I think this is a good method. I'm only left wondering exactly how far out must we look in order to avoid making our solution the problem. The reading has relevance to our course in that Hallsmith repeats the need to form relationships with each other in order to make positive change. In this course I feel we will be doing just that, individually, amongst each other in class, and with the community as we work to see change realized through our projects. At the same time we will build trust in the community and gain power in the decision-making process of this town. In the Hallsmith reading, there were a few key concepts that should be noted. Her first is the concepts surrounding community. Community, to the author, is central to building a strong and sustainable society. She holds that there are four premises that define community. These are: communities were created to meet peoples needs, communities are systems and can be studied using a systems approach, community systems exist to meet all our needs, and the community system can be looked at holistically revealing the way the community interacts with its surroundings. This definition is critical to the rest of the reading as Hallsmith writes in depth of the various aspects of community. These premises are logical and follow each other. Communities were started to spread the workload around making life easier and more prosperous. This led to interactions explained in the systems approach. As this community grew, its needs expanded so to support these needs, the community also grew. Finally, by taking all of the parts of the community and looking at how they interact with other communities, a basic understanding of how prosperous and effective a community is. The second key concept is how community is a whole system made up of many smaller parts. These parts include the three main actors in a community; individuals and households, organizations and businesses, and the government. These three branches work together to thrive and hopefully improve the community. She goes on to discuss how the three branches interact in very complicated ways and how by being helpful and cooperative, the three branches can live happier and more prosperous lives. This system can be studied using a system dynamics approach. This means of community study shows how complex a community interaction can be. It also shows how by expanding the parties involved, a system can spiral out of control very quickly and any slight feedback from an unintended party can quickly change the rest of the system yielding an unintended result. This is of importance when considering interactions with large parties such as in business situations. The third key concept is one that is critical to a community’s longevity and that is sustainable development. She defines it as “development that meets the needs of the present without compromising the ability of future generations to meet their own needs.” (34) This concept is crucial for the ongoing prosperity of a community because if the people can no longer live and prosper the way it used to, and can no longer find new ways to prosper, the community will wither and die. It also relates to the way communities use their natural resources. Issues such as drought and water shortages can result from not planning sustainably. These issues are of serious concern and can lead to large scale destruction and abandonment of towns and cities. This is also important when looking at a global community. Current trends lean towards overuse and waste. Within the not too distant future, these luxuries may run out and our way of life will collapse. Threats like these are very real and should be seen as a motivation to find new and revolutionary ways to go about our daily lives with less impact on the earth. Hopefully enough attention will be paid to sustainability that it becomes an industry standard and our environmental footprint will be reduced. Hallsmith uses simple language to explain the complicated interactions of human nature. I would imagine that when she looks at the varied conflicts humans get into, her solution would be an increased level of community. Community actors include 1)individuals/households 2)organizations and 3)governments. These actors create an interconnected web of interactions (community) that demand and supply its various and interrelated needs ( physical, economic, governmental and social ). Communities are thus made up of cyclical dynamics that satisfy the needs of the community members involved on a number of levels. Hallsmith discusses the many explanations for the various needs of human beings, citing Maslow, Manfred Max-Neef and Jurgen Habermas. After explaining the communities are made up of the various interactions that fulfill the needs of the individual, she then applies this concept to common community issues. Her chapter “Community capacity and sustainability” describes multiple scenarios in which the dynamic cycles of a community are not seen in whole and how this can lead to inefficient solutions. Inefficient solutions compound upon themselves, creating a negative feedback loop. If the problem which exists in the community which is causing it to not provide for the needs of the people in one area of their level of needs, this has an effect on the over levels of need. is seen as a whole. However, if the issue was seen as dysfunctional part of the whole which is effecting the provision of other needs, then the solution can be created that treats the problem and not its symptoms. In order to clearly think about a community as a whole system, systems thinking is necessary. Systems thinking allows us to analyze the causes and effects of a particular feedback loop so that we can appropriately react. While Hallsmith’s explanations of communities as whole systems seemed to be repetitive and simplistic, her examples are issues commonly faced by all of us—which allows for practical application of the information she is sharing. I found it fascinating that the reading connects with so many of my life experiences and that I was able to personally relate to her arguments. Planning books often seem over analytical, repetitive and simplistic to many readers because these books organize thoughts that we all have about the communities we live in. Because we ourselves have pondered these issues, we find what is written to be beneath us, or somehow not adding to our intelligence. I would argue that we should resist the impulse and give ourselves and the authors a bit more credit. We have thought about the cause and effect of various community issues, but we most likely didn’t take the time and effort to share our insights with others. Hallsmith mentioned that communities suffer when people do not take the time to care for others, despite numerous innovations to increase efficiency. She takes this a step farther by pointing out that we try to reduce wasted time by falling into habits. This decreases the thought processes we use to judge the importance of each action we take in our day, so we end up brainlessly working at the job we hate to provide for the strangers that live in our homes who we call family. Hallsmith introduces the phrase “critical mass” as the proportion of assets to the amount of need being met. Can critical mass exist outside of material resources? If so, then why doesn’t she use this word throughout the chapter? By looking at the community as a whole, rather than just the government or just the economy, we can see how systems interact, either eroding or enhancing their capacity to meet future needs (their sustainability). In decision making, it is necessary to consider the parts in relation to their effect on the system, rather than just problem-solving in isolation. Systems also affect one another; they are dynamic. One of the determining factors of a community’s sustainability is its ability to satisfy the needs of all of its members (actors) – governance, businesses and organizations, as well as individuals and households. Both equilibrium and entropy exist within a given system. Systems will at some level self-organize, and the more freedom the actors in a system have, the greater the possibilities for positive change. From a design perspective, the large impact is something we strive to consider for any project or idea, but often only in a social and environmental sense—perhaps because landscape architecture often views the environment as something that needs to be preserved and protected, and the social effect, whether a design is for a park or a backyard, is often what is most apparent. The reading points out that the governmental impacts and the economic impacts should also be considered. If they aren’t taken into account, they will still happen, and the end result could be something that is in turn detrimental in another area of the cycle. It seems as if the ‘environmental’ aspect of the systems was considered primarily in the sense that the environment provides resources. I feel that it could have been explored further, perhaps through additional scenarios, but even just in terms of the changes that would occur in an environmental system. There seemed to be a greater sociopolitical tone to the reading than there was a full exploration of the impacts upon the natural systems, and in turn, their impacts upon the social, economic, and political systems. I feel that the last connection was left out a bit. I also found it interesting when it was pointed out that the social health had the greatest beneficial impacts; perhaps this could have been explored as well. a) Cities function as systems. Looking at only parts of a city, its problems and its symptoms will only lead to an unhealthy city. Therefore in order to fix a problem one must see all the factors involved, and how every action can cause a reaction. People have many different needs; economic needs, social needs, and physical needs. All of the needs are interconnected and need to function together for a healthy city. Cities originated out of social needs (the need to be part of a community), however currently social needs are being artificially replaced by objects such as television and the internet. Often vicious (negative cycles) or virtuous (positive cycles) cycles are in play in cities. Therefore struggling cities will often become worse off. b) Ideas of social capital and community are important to look at in our daily lives. Hallsmith discusses Putnam’s theories that television, the internet, and changing women’s roles are leading to the decrease in social capital, clubs, and community. Often new technologies and advances which we view as promoting social interaction actually degrade it. System thinking is also important and often unfortunately overlooked. Often I am asked “what’s the point in trying to change/fix anything when it is only going to have a negative reaction on something else.” From viewing both the symptoms and from there identifying the cause there is less chance for negative repercussions, however I am always weary of the possibility of uniting factors such as environmental, social, and economic without negative reactions. The importance of community also provides another way to look at cities and what shape they are in. c) The need for community is not only necessary for individuals but for the survival of the community as well, however, how to regain the sense of community and clubs once had is a question which needs answering. Although I feel Hallsmith makes good points about system thinking, much of her points seem hard to apply in reality. I found this both in her plea to unite economic, social, and environmental factors, and in her advice to treat the root as opposed to the symptoms (as in the story of fixing the bad roads first). Often in cyclical situations the root becomes too difficult to find, and there is simply not enough resources to spend on every part of the cycle. Hallsmith argues that community is essential to human life and that all aspects of our human community are connected in some way. She claims that there are three main actors within the community (individuals/households, businesses/non-profit, and government) and that all of these actors have grown together over time. She also says that these actors interact with one another in order to meet their needs—needs which she divides into four categories: physical, economic, governmental, and social. Hallsmith argues that we must evaluate the processes and interconnections that shape our environment if we wish to make sustainable decisions and promote community wellness. This reading is very relevant to our course because it encourages us to think broadly and optimistically. As we prepare to engage the community, we must look at our projects critically and holistically. We must carefully think through our decisions and set specific goals—keeping in mind the unforeseen consequences of our actions. Overall, I enjoyed Hallsmith’s earnest approach and optimistic ideas, yet I have a few doubts about her perspective. I was particularly interested in the section about social capacity (p. 59) where Hallsmith talks about the key elements of a socially healthy society. She says that communities with high levels of personal contact (relationships between individuals) and volunteerism tend to be much more vibrant than communities that lack these elements. This observation seems obvious enough, but it still does not answer her initial question: “What is it that makes one community a warm and friendly place to live… or makes another community merely a place on a map…?” (59). Although research shows that volunteerism and personal contact are good indicators of a socially healthy society, I would ask what actually inspires these people to volunteer and engage in relationships. Why is it that some people are so friendly, caring, generous, and concerned while others remain so cold, distant, selfish, and removed? Even with all the right schooling and material blessings, do not many people still lead unproductive and unhappy lives? It seems to me that in order to build a socially healthy and sustainable community that you must change the attitudes and perspectives of the entire planet. You must expect humans to live for others instead of for themselves. You must expect that corruption will not infiltrate the system. You must expect that we can somehow do better than the countless generations that have failed before us. Is that possible? -The existence of communities is irrefutable. Communities exist out of human necessity. From this springs a definition of the sustainable community different from the usual: a community ceases to be sustainable when it does not meet a human need any more. Sustainable communities are purely need-based. -One must therefore assess whether or not communities are efficiently satisfying human needs. This assessment is the first step leading one to acknowledge how difficult it is to give a single answer to such a question. Communities suddenly appear infinitely intertwined and complex, constantly evolving in the interactions with each other. This is where applying a systemic model to the notion of community helps one to better understand the holistic nature of planning sustainable cities. The sustainability of a community depends upon the health of its economy, of its actors, it depends upon its social justice system, and all these active components of communities, in turn, act upon each other. -A larger picture emerges: a sustainable community is not only one that cares about the environment. Sustainable communities are more loosely defined as communities in which its actors may lead whole lives. These passages bring a very different take on what I thought was sustainability, which, to me, was a purely environmental consideration. Adopting a holistic viewpoint to tackle an unsustainable practice, before any action is taken, is essential. It pushes the ecological minded planner, for example, to look at other fields rather than just his own, to get a good sense of the whole picture. It then becomes impossible to believe that by solely narrowing roads, for example, people will be dissuaded to drive because of road congestion. The planner will have to think of the mentalities and values of the actors of the community, which one would have to act upon to help the planning decision of narrowing roads become more efficient. Rooting back sustainability problems to mind frames, vicious economic circles,... seems like the right way to look at reality. The problem is that there is always great reluctance to take in the whole picture, because one is then overwhelmed by the amount of work that needs to be done, or by the complexity of it all. This is why Hallsmith’s initiative of simplifying reality by modeling it through system dynamics is reassuring, because it seems much easier to tackle reality. But I am doubtful it is always this easy to lay down urban problems. (a)Whole communities are essentially systems established to meet the needs of its members (a “need” is defined as a lack of something required to live a “whole human life”). Within a community there are three main actors (the individual/household, organizations, and governing bodies) and four basic needs (physical, economic security, governance, and social well-being). Communities are fundamentally systems that are designed to meet our needs based on the fact that the needs satisfaction processes work in a cyclical fashion. Communities have a variety of capacities which can be enhanced or eroded; if a community capacity is being enhanced, it will be easier to meet the same needs of future community members. Such capacities are the following: economic, environmental, governance, and social. A “community asset” is defined as the facilities, services, relationships, programs, and natural resources that help a community meet its needs. There are system “archetypes” which usually consist of some combination of reinforcing and balancing loops. Some of the system archetypes are: “shifting the burden” (i.e. traffic and sprawl), vicious and virtuous circles (i.e. education), the multiplier effect seen in economic cycles, and “limits to growth” seen in growth and development. *The closer an economic system is in sync with the renewal of its natural resource base, the more sustainable it is. (b) This reading outlines the concepts of community which are the foundation for understanding sustainability at a community level. Without understanding our needs, how they are met, and the consequences of meeting certain needs in certain ways, no future action can be taken to become more sustainable as a community. Also, it is imperative that we understand that our communities are very complex and non-linear; taking steps to become more sustainable requires in-depth analysis of our behaviors and the relationships individuals, organizations, and governments have within a community. (c) Hallsmith does an excellent job of describing individual and community needs and the driving forces within a community. However, thus far she presents no suggestions for future action. Is this a major flaw of the reading or an underlying suggestion of the creativity that can be applied to the growing problem of sustainability? Also, is there any needs-philosophy that Hallsmith finds most appropriate to adhere to in understanding human needs? Gwendolyn Hallsmith’s The Key to Sustainable Cities outlines the importance of sustainability and systems thinking as the foundation for community planning. Rather than perceiving cities, towns, villages or neighborhoods as distinct entities, Hallsmith advocates a holistic approach that views communities (loosely defined) as greater than the sum of its parts. In order to understand the inherent dynamics of communities, Hallsmith suggests identifying the interconnectedness between the 3 main actors: individuals/households, organizations (and institutions) and governmental bodies. These separate agents interact in either sustainable or unsustainable ways. Hallsmith’s definition of sustainability expands upon the Brundtland Commission’s which focused on intergenerational equity to include Natural Step’s focus on global resource equity. Equity as well as economic security and social well-being are needs that Hallsmith contends are just as necessary as basic human needs for a functioning, sustainable community. These additional needs ensure appropriate power sharing which would in turn promote equitable access to and allocation of the required resources. The inclusion of these needs and the proposed effects would either create a vicious or virtuous cycle. Categorizing processes and events within communities as vicious or virtuous cycles is an example of systems thinking. Systems thinking, first pioneered in the 1950s, is a framework for developing and analyzing natural and human systems. Systems thinking rejects the idea that problems exist in a vacuum. Instead systems thinking requires an understanding of the entire system (in this case – the community) in order to evaluate the unintended consequences of a solution before the solution to one problem just creates another problem. Applying systems thinking to community planning provides the tools for creating sustainable communities because it acknowledges the dynamic and organic characteristics of communities. Communities as aggregates of individuals (organizations and governments) are not static and therefore require a flexible, self-regulating paradigm. Using systems thinking to identify the causeffects already in place will only strengthen our ability to create progressive, proactive plans for future sustainability. If sustainability is about finding an equitable balance of ideas, needs and resources then the search for solutions needs to be abandoned in favor of a working model that incorporates change and self-determination as its fundamental premises. This course with its focus on student participation and community involvement is structured to effectively employ systems thinking. However as an academic setting this course is also in the position to analyze and evaluate systems thinking as well as sustainable planning. While Hallsmith provided a thorough background into both, she was quite general in her analysis of the interconnectedness and responsiveness of community agents. Much of her understanding of communities and the appropriateness of systems thinking seems to rest on individuals' need for social interaction and their interest in participating in their communities however this contradicts with the need (as she correctly identified) for self-determination. Requiring activism as an inherent feature of a sustainable model seems to be a fundamental flaw because it is creating a system that will inevitably fail if its members cease to be motivated. A realistically healthy community should only depend on some of its members to be communally minded and allow for a portion of its community to consist of solely self-interested parties. Hallsmith begins her book by discussing her definition of community. It is a body that exists out of necessity, and always has. It consists of individuals, businesses and organizations, and the government. For her communities exist to fill the basic human needs which could not be met by an individual, business/organization, or government alone. She defines these needs as: physical well-being, economic security, governance, and social well-being. A community exists to make it possible to meet these needs, but it is also a system, and therefore subject to system dynamics, which she describes in a later chapter. She also comments on the development of community systems from simple in the past to more and more complex organisms always on the edge of chaos. Using the example of a faucet and drain, she explains that many people are not conscious of the complexity of many systems because they are so large and complicated. We don't often stop to consider where our water comes from or where it is going. In the chapter about capacity, Hallsmith writes that a community has assets--those things that can meet the basic needs. These assets have the characteristics of critical mass, distribution, and regeneration and thus have the capacity to fill the needs of a sustainable community. She breaks the assets down into four basic categories: economic, environmental, governance, and social. She then goes on to explain what system dynamics and systems thinking are. She defines the basic language used, and provides some examples of different systems. Hallsmith's book clearly relates to the topic of the class- the creation/re-creation of sustainable communities and cities. She provides us with what could be a useful analytical tool for beginning to understand the complexity of the world we live in. Often people do not act or take part in the world because they find it overwhelming. Her method might make it more possible to look at the world as something more manageable and therefore worth being a part of. She also attempted to bring out something that is very necessary in this work: the need for larger perspectives. We all can experience in our lives that approaching a problem without an holistic understanding often backfires. It is important though, that small changes in a positive direction, with an understanding of the whole system, can eventually make a big difference. Perhaps this is what is most useful from the reading: when we act, our actions affect everything else, whether for good or bad. So we automatically have immense responsibility great power. I had some difficulty with this reading because some of the ideas, even though she was talking about systems dynamics, were not very dynamic; they were not altogether new and, as another blog mentioned, seemed a bit naive. It was not until the very last three points that I found something that seemed applicable and useful. Her lessons for sustainable communities: 1-order cannot be imposed, but will become clear in a self-organizing way, 2-making actors in a community more free will "increase the possibilities for positive change. ", and 3- trying out many possibilities while being free to mess up is very important. On page 38 she poses that information is power, while education is caring. I disagree on this point and I think it is an important one. A person can have access to massive amounts of information, on google for example, but without the empowerment of an education, it is all but useless facts to be collected. I thought her point that although humans can adapt to living in terrible circumstances, simple survival is not good enough. We must have ideals, and still be able to be realistic in that we are open to understanding the many aspects of any given situation. One last thought that came up while I was reading: in Germany they are seriously discussing the possibility of a "basic income." This means every person, regardless who they are, would receive an income on which they could reasonably live. There are many implications: people would work because they wanted to, employers would have to reconsider the way they treat their employees, and jobs that are not relevant and not useful would be phased out. Also, people who have talents in professions like art, dance, theater--even homemaking, could more easily pursue what they love to do. Just am idea I think is interesting! The three readings, encapsulated by the class handouts and expanded by Hallsmith, function as an indoctrination into thinking about cities, communities, human bodies—anything, really—as systems: evolving, vibrant, intricate webs of interaction that at once defy and define the very patterns of our lives. The living systems sheet begins by describing the basic tenets of a (sustainable) system, identifying the principles of interdependence, synergy, integrity, and regulation as key components of a living system. The permaculture design principles distilled in the Holmgren handout begin to elaborate the hallmarks of truly sustainable systems; i.e, those that are self-regulating, productive, and frugal. With those guiding principles in mind, Hallsmith’s reflections on the kinds of systems that comprise life as we know it primes us for a discussion about whether the key players in the city/community system—individuals, organizations/institutions, and government—are helping or hindering the development of sustainable systems. With liberal use of anecdotes, she teases out the underlying systems—some visible, some less so—that are chiefly promulgated by the key players. The reader is encouraged to view the more banal aspects of living, such as working, voting and playing, as more than a series of independent endeavors. These actions, she argues, are irrevocably linked by systems and cycles that have evolved in response to multitudes of economic, social, spiritual and physical needs. Whether the needs of the individual and the community are being met in part, as a whole, or not at all, depends to a great extent on whether the community’s resources and capital reserves are being deployed intelligently and equitably. The best systems, those that foster virtuous cycles and in the end prove sustainable, are the ones that grow out of respect for each other, for providing and accepting feedback, and for using resources without exceeding their capacities. Of course, it’s easy to see the value of designing sustainable systems, and the simple fluidity of the ideal systems that Hallsmith envisions is incredibly appealing. Why can’t we all just get along, care for each other, contribute to the community in meaningful ways, live frugally, give back, etc? Don’t we all want to be cared for, feel a part of something, have enough to get by, be productive and not destructive? I’m not posing these questions rhetorically or out of cynicism: I mean to say that those are the philosophical questions that seem to be at the heart of sustainable practice. But clearly, those fundamental impulses and desires haven’t produced anything even closely resembling a sustainable city (save a few), nation, or planet. I don’t have an answer to that, but I do know that the simple assumptions upon which Hallsmith bases her sustainable systems and virtuous cycles are not always what we have to work with; to assume them a priori is to problematize the situation not nearly enough. Hallsmith defines communities by the way they meet the needs of their members, with needs being physical, economic, governance, and social. The processes and interactions that take place to meet the needs of the members emphasizes the dynamic nature of communities, and downplays the notion that communities are places that can be created simply through proper road alignment and dwelling orientation. Given that communities are created through processes rather than physical characteristics, it is clear how Hallsmith understands communities as greater than the sum of the parts. Only through their dynamic interaction does a true community form. Following from this groundwork is the notion that communities are composed of various feedback loops that can’t be completely disentangled from the whole. The foundational knowledge espoused by Hallsmith is relevant to our class because it orients our thinking away from static objects and towards dynamic processes that take place between people. Hallmsith introduces complexity and nuance that must be addressed to affect change within actual communities, and beginning our class projects with a focus on relationships will most likely lead to greater long-term success. While it is true that communities operate as complex organisms, I gleaned from Hallsmith’s writing a belief that learning about feedback loops and understanding how communities are organized will translate into a more equitable use of power and resources. I don’t wholly believe that inequalities, whether social or environmental, are the result of lack of knowledge; rather, inequalities arise from those in power giving consideration to themselves - and those they affiliate with - before those for whom they have no relations. The flow of resources up the economic ladder, from worker to owner to political/religious bodies is a quality found in historic civilizations, and this distribution of wealth and power is based more on the need to control resources than on the desire to allow every person to experience self-actualization. Those with power will be hesitant to relinquish power and the associated economic and social benefits arising from it for the sake of others for whom they share no ties. This biological and cultural artifact of civilization is a true roadblock to social and environmental sustainability that calls into question the fundamentals of modern society. A lot of the theories and strategies outlined in the Permaculture article were all based upon a design and lifestyle that produces and consumes in a cyclical natural order. It seems that in a consumer dominated society, from a micro or macro scale, when consumption dominations production the shape of that natural design begins to appear more linear than cyclical. In part 2 of this article, there is a major focus on the use of natural energy such as fossil fuels, sun and the wind. These natural resources are not renewable and therefore consumption needs to be moderated in line with production to not create a drastic imbalance. Another aspect of this article that I found interesting but at the same time mildly controversial was part 6 titled Produce No Waste. This point describes an idealistic way of life where all waste is not disposed or burned but used for another cause. This article points out the earthworm as an icon for this notion because the earthworm demonstrates a design where the output of one is the input of another. Putting this notion into context with American society, it goes back to consumption. Because we consume so much, our outputs are too much for anything to take in as an input. Therefore, the pollution and waste that is left over builds up and harms the environment tremendously. Hallsmith’s explanation of the relationship between systems within a community was also very interesting. One of the most valuable statements I took away from this chapter was when she wrote about understanding that the connections and relationships are more important than the elements themselves within a large social system. Even though this was meant to pertain to a social perspective, it can be easily linked to the Permaculture article in the sense that society is a huge system with so many branches and connections. Whether it is social, environment or political, all three and so many more aspects go into creating a system. A community is a dynamic equilibrium. Communities are like living breathing organisms that are constantly changing and “more than the sum of its parts.” Gwendolyn Hallsmith says that connectedness is the defining principle of all communities. Every community, local, government and world is connected and all decisions made will affect others in large and subtle ways. When there is a problem or issue in one sector of the community no matter how insignificant, it will come full circle and affect the whole community in some way. It is important to value every person in the community and for everyone to know their role and how they affect the community as a whole. Open communication and a welcoming environment that accepts diverse opinions where people are “free to make mistakes” is necessary for a healthy community. Viewing the community in a holistic way is a crucial element when developing sustainable communities. Addressing only symptoms instead of finding the root cause of the problems, will lead to more problems. The author gave an example about road maintenance and repair problems in a small town. The citizens complained about the poor conditions of the roads and wanted relief. The local government wanted to use all their available funds to completely rebuild the worst roads, thereby depleting funds for all other road maintenance. Thankfully there was software available that allowed the town to see the economic impact that decision would have made and they were able to get a bigger view of their problems. My question is; how do we view issues in a more holistic way when software is not available? How do we start to implement the ideas of sustainability realistically with limited resources, money, talent, leadership and conflicting agendas? How do we open our eyes to the long term goals and not the short term needs of the moment? Perhaps our group projects will be a micro study as to how workable sustainable communities could be in the real world. It will be interesting and illuminating to see how our groups handle differing interests and perspectives and the creative solutions we will come up with. In order to create the foundation for sustainable development in a community, the perception of “connectedness” is necessary. This is a holistic view of a city as a living thing, not just the infrastructure, but the social systems and relationships between them as well. All parts, on every level, from the individual to the local organizations to the government, are essential to each other and to the whole for sustainability. Community needs are defined as something required to live “whole human lives” – and include the physical, economic, governance, and social. Community Capacity is the community’s ability fulfill to its member’s needs. Community assets are individual need satisfiers, (i.e. ; facilities, services, relationships, programs, natural resources, and people) and assets are accessed through need satisfaction systems. Critical mass is the aggregate amount of an asset required to satisfy the demand. How distribution is handled (equitably or not) and planning for regeneration of an asset can affect its qualification as critical mass. Systems thinking is a holistic asset-based approach to problem solving in communities, as opposed to a problem-focused way of thinking. It encourages an examination of relationships between all elements of the larger social system. There is an emphasis on relationships being more important than elements themselves. A critical concept is that a system always becomes greater than the sum of its parts. The view of the community as a living entity with different parts of the system working together like parts of a living organism is something that I’ve been exposed to since I came to Cornell, and have found to have extreme relevance. I’ve most often heard it referred to as the “(bio)ecological systems view”. Over the summer, I worked in the Division of Nutritional Sciences, on research having to do with stemming the rising tide of childhood obesity. Our research team was continually coming back to the ecosystems view of the community; the micro, meso, macro, and exso parts and their interconnectedness, in order to dissect the cause and effect relationships and sources of influence. I appreciated the description of the dynamic state of cause and effect; as being either linear (feedback) or cyclical (feedback loop). The term “causeffect” was extremely poignant to me, as the reality and enormous destructive (or restorative?) potential of the “vicious cycle” when it comes to humans and their relationship with the environment is what I hope to better understand through this course. I felt that the Hallsmith’s definition of needs as "a lack of something required to live whole human lives" could have been bolstered by a further definition of what a "whole human life" would look like. 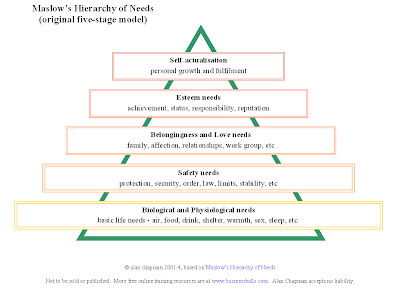 Perhaps by referring to Maslow's Hierarchy of Needs, Hallsmith could have explained what elements of the various levels of "need" constitute a "whole human life," and how this might change according culture, background, socio-economic status, etc. Also, when comparing the success of one community to the next, at meeting it’s member’s needs, it seems that success would be dependent on these different levels of need. I was left wondering if an asset is still considered an asset if there isn’t a critical mass? I am in complete agreement with Hallsmith’s assertion that “a community is impoverished if only a very few people are able to satisfy their needs.” I felt that the Capacity Building Story seemed rather superficial and lacking in critical content without telling us what type of capacity building they did in Maine? The significance of the statement “you can’t have community development without building trust” seemed incomplete without an explanation of what they actually did to build the trust. Hallsmith mentions on pages 42/43 "that it is possible to predict the level of crime in a neighborhood by merely quantifying the social interactions of its residents." She goes on to say that when social networks are strong, sense of community and social well-being are consequentially reinforced. I was confused without a further elaboration of how "social interactions" were measured, and/or categorized in order to determine that there was a causal relationship with the level of crime. a) The key concept and the basis of the reading was the fact that the world we live in is a system. Every event and action is connected together in one way or another. The first point that struck me was the idea that the system that we exist in is two faced. It can be an exremely strong and powerfull forced which fosters life and happiness. It can also be dysfunctional and unsustainable as mentioned later in the reading it is a challenge to try to figure out at what point does the system go wrong. The system has many cyclical tendancies to it, this fact makes it extremely important to be concious and aware of teh fact that no action is independent. To use the cliche phrase "what goes aroung comes around" one mistake or a lack of thoughtfullness is affecting other things and will eventually come back to you in another way. This leads into my other idea that community success is a wholistic act one can not look at individual pieces of a community and later expect that community to be a success everything must be viewed as a whole in order for full success and sustainability and environmental success to occur. It is important to know and be aware that these large wholistic actions can often not take place without government action. It is often believed that the government is a negative force on society but in reality they can be the most powerful force towards large scale change, awareness, and sustainability. b) The idea thaat i really took away in terms of the class is that a "eco city" is not a place where merely sustainable practices are enforced and practiced, as i had previously thought. A sustainable and ecological city is one where every choice, desision, and action is taken with great care and thought. Systems can fall apart when too much emphasis is placed on one side such as social needs and not enough is placed on the other sides. A smaller idea that struck me as more i would liek to learn about in th class is something that was addressed in teh first day video and that is the contrast of ecological footprints between Americans and people of other countries. I was always aware of this difference but i am interested to learn more as to why it occurs. Overall this reading has really taught me to look at communities and systems in a much different way. I want to start to examine these systems that surround us and really take time to see how the systems interact together. c) I somewhat addressed my first question in the previous answer that i would like to examine global ecology and why different countries have different ecological footprints. The second thing that really intruiged thought for me was the five key variables for sustainable economic development. I do not know enough yet about sustainable development so i do not knwo exactly what my opinions are but i would really like to continue to refer back to these key concepts as i learn more and develop more of an opinion.